Barbet Schroeder’s loose remake of 1947’s Kiss Of Death has aged awkwardly in comparison to its predecessor, despite a nearly 50-year age difference between the productions. The newer film feels abbreviated from a much longer work, and Schroeder and screenwriter Richard Price try something akin to what Gus Van Sant did in his remake of Psycho, attempting to recreate a presentational style of delivering subtext plainly through dialogue, which is characteristic of many American sound films produced prior to the 1960s. 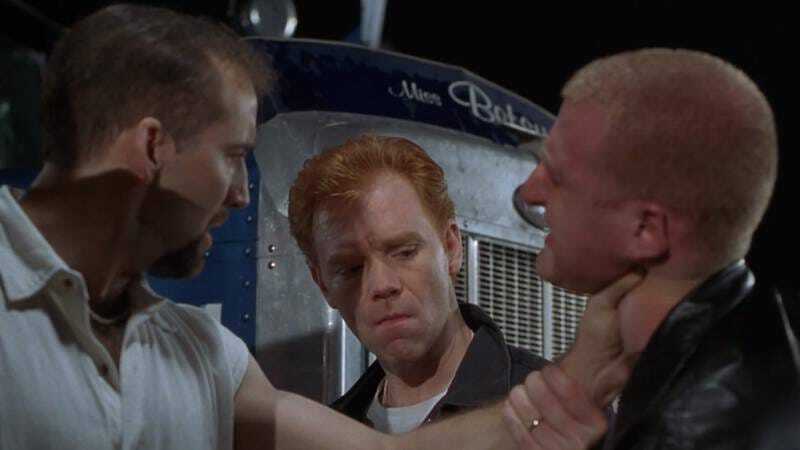 This conceit is most obvious in the conception of Rosie (Kathryn Erbe), a former babysitter who sticks by tormented ex-con Jimmy Kilmartin (David Caruso) with a blandly steadfast selflessness that borders on the laughable, perhaps intentionally. Trevor Jones’ score is a significant mistake, as it suggests a soundtrack that might accompany a low-rent early 1990s TV-movie, and the film oscillates uncertainly between other 1940s and 1990s-era tropes, taking place in a movie-only dimension in between that’s either too fantastical or not fantastical enough. All that having been said, 1995’s Kiss Of Death is generally underrated; its reputation as a career-killing turkey is almost as exaggerated as Showgirls’. Schroeder’s direction is smooth, authoritative, and a touch impersonal, with Price arising as the film’s auteur. This Kiss Of Death is at its best when two characters are simply in the frame in two-shots that allow them to bat the screenwriter’s poetically elastic dialogue back and forth, revealing more about one another than either intended. A hood discusses the blossoming success of his organization in terms of shoes; his feet each require different sizes and now he buys two pairs rather than padding one shoe in order to match the dimensions of the other. An assistant district attorney observes of the name of criminal Big Junior (Philip Baker Hall): “That’s one of those expressions, like jumbo shrimp.” Another hood can’t drive red cars, even cars that were once red, because, underneath the paint, they’re still red. And so on. Fans of Price’s novels will recognize these bits as savory cartoon variations of the socially complicated encounters that frequently figure into his wonderful novels. Performing these bits is one of the best and most varied casts of any 1990s-era American movie. In addition to Hall and Caruso, there’s Helen Hunt, Michael Rapaport, Kevin Corrigan, Anthony Heald, Jay O. Sanders, Anne Meara, Hope Davis, Ving Rhames, Stanley Tucci, Samuel L. Jackson, and Nicolas Cage. (About the only people missing from this thing are Debi Mazar, Parker Posey, and Steve Buscemi.) Jackson and Cage, on the brink of megastardom for Pulp Fiction and Leaving Las Vegas, respectively, deliver the finest performances, with Tucci coming in at a close third. Jackson provides the film its tormented soul, with a memorable gimmick in which his police officer involuntarily cries, while Cage energizes it with bursts of broad vitality, playing Big Junior’s son, Little Junior, as a cross between a slyly enterprising pit bull and a rampaging gorilla. Yes, Caruso’s upstaged in the midst of these theatrics, but that’s the point, as he’s playing the audience surrogate-as-protagonist, which depends on his character getting screwed for over for 90 percent of the narrative until an obligatory, half-heartedly victorious finale. In retrospect, it’s a dicey, strategically unwise stance for an aspiring movie star to take: Caruso staked his career-move on a role designed to showcase every other actor in the project but him. Availability: Kiss Of Death is available on a nearly out of print DVD through Amazon or possibly your local video store/library. It is also currently streaming on Netflix.